Preview Open: Primary 3pm – 6pm, Backlit 3pm – 7pm, One Thoresby Street 6pm – 9pm. After Party at Nottingham Contemporary: 9pm – 1am. 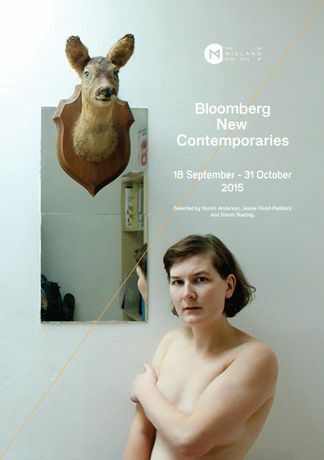 With 2015 marking 15 years of Bloomberg’s sponsorship of New Contemporaries, One Thoresby Street are proud to be a key partner in the delivery of Bloomberg New Contemporaries that will be launching across New Midland Group venues (One Thoresby Street, Backlit & Primary) from 18th September to 31st October. With Public Programme events at Nottingham Contemporary, New Art Exchange and Nottingham Castle; before touring to ICA, London from 24 November’15 to end of January’16. 2015 Selectors: Hurvin Anderson, Jessie Flood-Paddock and Turner Prize Winner Simon Starling. Selected artists for Bloomberg New Contemporaries 2015 are: Sïan Astley, Kevin Boyd, Lydia Brockless, Kanad Chakrabarti, James William Collins, Andrei Costache, Julia Curtin, Abri de Swardt, Melanie Eckersley, Jamie Fitzpatrick, Justin Fitzpatrick, Hannah Ford, Sophie Giller, Richard Hards, Juntae TJ Hwang, Jasmine Johnson, Tomomi Koseki, Hilde Krohn Huse, Pandora Lavender, Jin Han Lee, Hugo Lopez Ayuso, Beatrice-Lily Lorigan, Scott Lyman, Hanqing Ma & Mona Yoo, Scott Mason, Oliver McConnie, Mandy Niewohner, Hamish Pearch, Neal Rock, Conor Rogers, Katie Schwab, Tim Simmons, David Cyrus Smith, Francisco Sousa Lobo, Aaron Wells, Morgan Wills and Andrea Zucchini.